We consider a system of N identical independent Markov processes, each taking values 0 or 1. The system describes the stochastic dynamics of an ensemble of two-level atoms. The atoms are exposed to a photon flux. Under the photon flux action, each atom changes its state with some rates either from its ground state (state 0) to the excited state (state 1) or from the excited state to the ground state (stimulated emission). The atom can also spontaneously change its state from the excited to the ground state. We study rare events where a large cumulative emission occurs during a fixed time interval [0, T]. For this, we apply the large-deviation theory, which allows an asymptotic analysis as N → ∞. The research of E. A. Pechersky, S. A. Pirogov, and A. A. Vladimirov was performed at the Institute for Information Transmission Problems (IITP), Russian Academy of Sciences, and was supported by a grant from the Russian Science Foundation (Project No. 14-50-00150). The main contribution by S. A. Pirogov is in Sec. 5, the main contribution by A. A. Vladimirov is in Sec. 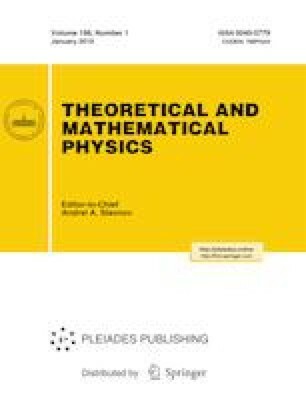 6, and the main contribution by E. A. Pechersky is in Sec. 7. The research of A. A. Yambartsev was supported by the Conselho Nacional de Desenvolvimento Científico e Tecnolôgico (CNPq Grant No. 301050/2016-3) and the Fundação de Amparo à Pesquisa do Estado de São Paulo (FAPESP Grant No. 2017/10555-0). Prepared from an English manuscript submitted by the authors; for the Russian version, see Teoreticheskaya i Matematicheskaya Fizika, Vol. 198, No. 1, pp. 133–144, January, 2019.